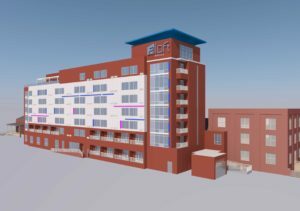 Clancy & Theys has been chosen as the general contractor for the new Aloft Hotel planned in downtown Wilmington. The 125‐room hotel will be adjacent to the Coastline Conference & Event Center, which Clancy & Theys will be renovating as part of the project. “It’s a blending of the old and the new,” said David F. Michael, vice president and CEO of the Clancy & Theys Wilmington division, noting that the project will maintain the historic structure of the conference and event center, while incorporating modern features in the hotel. The seven‐story hotel will feature a rooftop bar lined with LED lights. The custom lighting will make it visible from the Cape Fear Memorial Bridge at night, cementing the new hotel as a signature landmark of the historic riverfront. 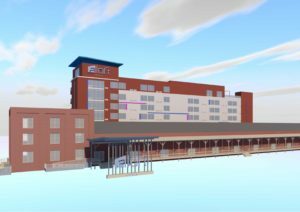 Guests will be able to host weddings and private events on the rooftop, which will look out across the scenic Cape Fear River. Poteat Hospitality is developing the new Aloft and will manage the hotel once it is open. Construction is expected to begin in downtown Wilmington within the next 30 days, and Clancy & Theys anticipates the project will take about 18 months to complete. The Aloft Hotel is only one of Clancy & Theys’ high‐profile projects in Wilmington, including several construction projects in the downtown and mid‐town markets. Most recently, Clancy & Theys was selected as the construction manager for North Waterfront Park, a multi‐use public space along Wilmington’s historic riverfront. Clancy & Theys is excited to begin work on this project and to help modernize downtown Wilmington to accommodate the growing population, while maintaining the community’s historic feel. Read more about Wilmington’s new Aloft Hotel in the Wilmington Business Journal here.